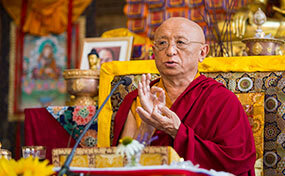 Chokyi Nyima Rinpoche gave teachings on the Heart Sutra, presided over the Ngakso puja, offered precious mind teachings and geve the transmission for the Samantabhadra Aspiration prayer during a solar ecipse. 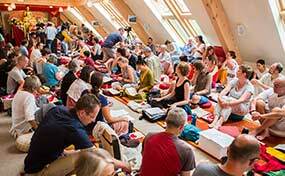 Having just concluded his seminar at Gomde Germany-Austria, entitled 'Buddha-nature', Chokyi Nyima Rinpoche believes the teachings he offered were especially profound, precious, and applicable, and will therefore benefit a great many students. 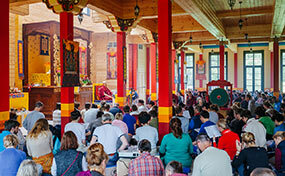 Chokyi Nyima Rinpoche was recently visiting Gomde Germany - Austria, where he was teaching the Heart Sutra, which is now posted on DharmaSun.org. Following Chokyi Nyima Rinpoche's longstanding wish to have access to photos and the names of all those who feel close to him, we are delighted to announce today the launch of the Shedrub Mandala Student Sign Up! 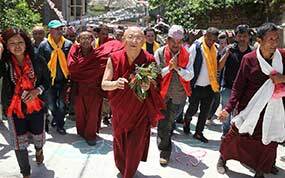 Chokyi Nyima Rinpoche's arrival at Gomde Germany - Austria. 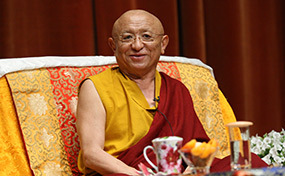 Rinpoche greets his students, inaugurates the new elevator and gives a short welcome talk. 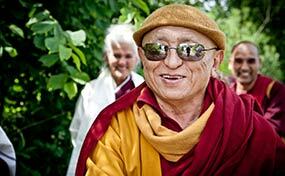 Impressions from Rinpoche's recent visit in Ukraine. 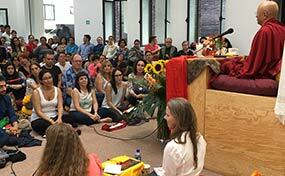 Teachings - Ngakso Puja - Refuge ceremony - Triple Excellence presentation.